saw this rickshaw while stuck in traffic on juhu-versova link road. 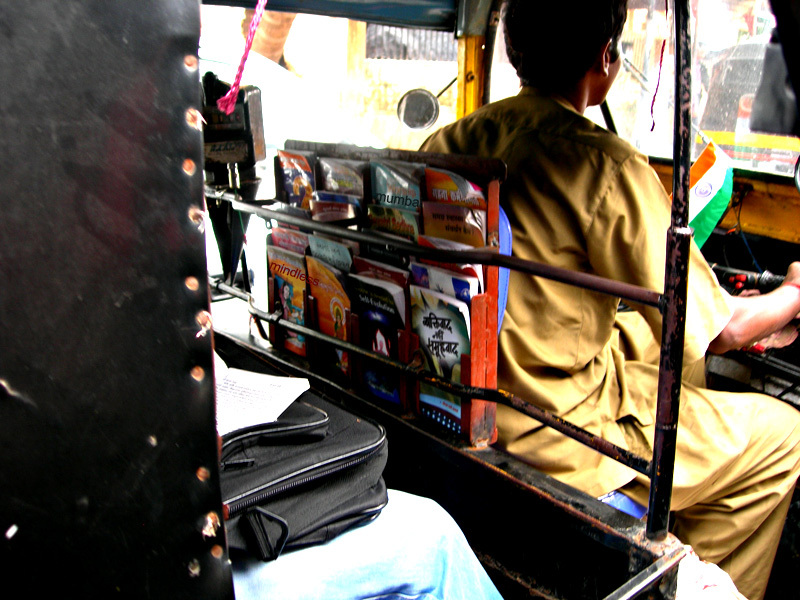 on the rear side of the driver's seat was this stack of books, in hindi as well as english. haven't seen any other rick like this before. i was wondering about the kind of books he would keep in here. i can't make out any of the titles, except on; which reads: 'self evolution'. nothing like a quick read while stuck in the traffic, eh? Wow! I love this photo! And that driver sounds like a very literate man. Hihi. I love photos like this! What a great way to travel. I think people should read a book then leave it in for the next person. It's a rare soul who could find self enlightenment under those circumstances. Me, I would prefer comic books. @ Pragya: Thanks for the comment and the info! I did not know that these were books from a specific organization. And I have not seen many such rickshaws in Mumbai. But it's a great initiative indeed.